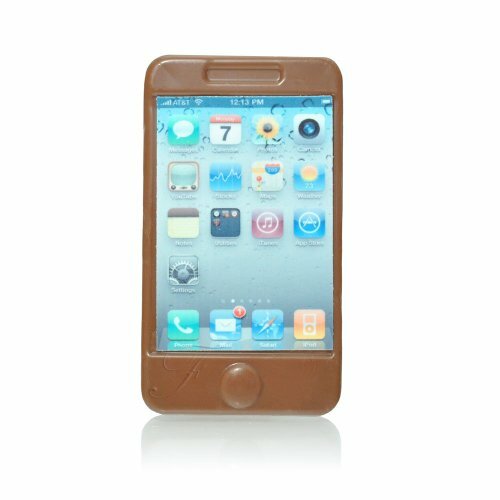 A solid milk Chocolate iPhone, the perfect phone upgrade for the gadget fan. Made from delicious, creamy milk chocolate it may not connect to the internet, but it certainly is tasty. Ingredients: Sugar, whole milk powder, cocoa butter, cocoa mass, modified starches (E1422, E1412) emulsifier soya lecithin, maltodextrin, aroma: natural vanilla, dextrose, glycerine, water, stabilisers (E414, E460i), emulsifiers (E471, E491, E435, E330), sweetner: glucose, aroma: vanillin, preservative (E202, E330), food colour: E171, E133, E104, E122, E124, E151, E110. Cocoa: 30% min. Milk Solids: 14% Min. This product contains azo-food colours. May have adverse effect on activity and attention in children.